A former Member of Parliament (MP) for Atwima-Nwabiagya, Mr. James Adusei Sarkodie, has called for the police to act with full force to stop land guards from terrorizing and making life miserable for the people of Ahodwo, a community near Sepaase. The criminal gang has unleashed violence on the residents - brutalizing, seizing their cash, phones and other valuables. Mr. Sarkodie, who spoke to the Ghana News Agency (GNA), described what was happening as complete lawlessness and heartbreaking. This comes amid on-going litigation in the Asantehene's court over title of the vast Ahodwo lands. The former MP, a native of the town, said he found it difficult to rationalize, why anybody would want to use brute force to seize, cut down cocoa, citrus and other food crop farms and sell these to developers even before the determination of who the real land owner was by the Asantehene. 'That certainly is wrong - not the right thing to do and could only lead to needless trouble, confusion and clashes', he added. 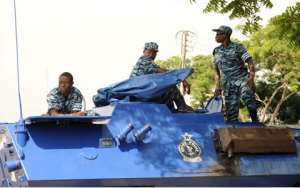 Police Chief Superintendent Godwin Cashman Blewusie, the Abuakwa Commander, told the GNA that, the activities of the land guards had not been brought to his notice. He however, vowed to swiftly and firmly tackle any lawlessness, adding that, the police would go after everybody, who broke the law. He spoke of his unswerving determination to make sure that nobody was allowed to get away with any breaches of the law, saying 'that is not going to happen'.